PURDUE (US) — Rising surface temperatures in the Arctic could affect a unique chemical reaction that helps rid the air of pollutants, experts report. “We are racing to understand exactly what happens in the Arctic and how it affects the planet because it is a delicate balance when it comes to an atmosphere that is hospitable to human life,” says team leader Paul Shepson, a professor of chemistry at Purdue University. Surface temperatures in the Arctic are rising three times faster than the global average. Changes there are felt throughout the rest of the planet through weather shifts, like the longer and colder winter the Midwest experienced this past year due to Arctic weather systems, Shepson says. Ozone in the lower atmosphere is different from the stratospheric ozone involved in the planet’s protective ozone layer. This lower atmosphere ozone is a greenhouse gas that is toxic to humans and plants, but it also is an essential cleaning agent of the atmosphere. Interactions between sunlight, ozone, and water vapor create an “oxidizing agent” that scrubs the atmosphere of most pollutants human activity releases into it, Shepson says. Temperatures at the poles are too cold for the existence of much water vapor, and in the Arctic this cleaning process appears instead to rely on reactions on frozen surfaces involving bromine, a halogen gas derived from sea salt. This gaseous bromine reacts with and destroys atmospheric ozone. This aspect of the bromine chemistry works so efficiently in the Arctic that ozone is often entirely depleted from the atmosphere above sea ice in the spring, he said. While it was known that there is more atmospheric bromine in polar regions, the specific source of the natural gaseous bromine has remained in question for several decades, says Kerri Pratt, a National Science Foundation postdoctoral fellow in polar regions research at Purdue who participated in the research. “We thought that the fastest and best way to understand what is happening in the Arctic was to go there and do the experiments right where the chemistry is happening,” Pratt says. 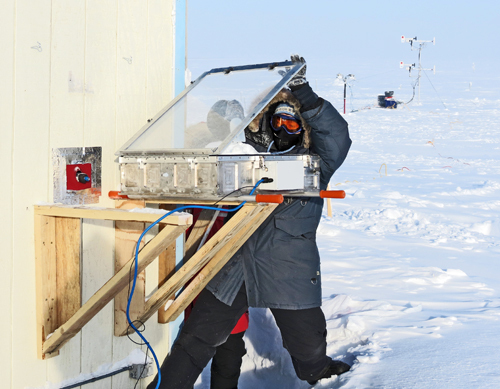 She and Purdue graduate student Kyle Custard performed the experiments in minus 50 to minus 30 degree Fahrenheit wind chills near Barrow, Alaska. The team examined first-year sea ice, salty icicles, and snow and found that the source of the bromine gas was the top surface snow above both sea ice and tundra. “Sea ice had been thought to be the source of the gaseous bromine,” she says. “We had an ‘of course!’ moment when we realized it was the snow on top of the sea ice. The snow is what is in direct contact with the atmosphere. Sea ice is critical to the process, though. The team also discovered that sunlight triggered the release of bromine gas from the snow and the presence of ozone increased the production of bromine gas. A series of chemical reactions that quickly multiplies the amount of bromine gas present, called the “bromine explosion,” is known to occur in the atmosphere. The team suggests this also occurs in the spaces between the snow crystals and wind then releases the bromine gas up into the air above the snow. The team performed 10 experiments with snow and ice samples contained in a “snow chamber,” a box constructed of aluminum with a special coating to prevent surface reactions and a clear acrylic top. Clean air with and without ozone was allowed to flow through the chamber and experiments were performed in darkness and in natural sunlight. The team also measured the levels of bromine monoxide, a compound formed from the reaction of bromine atoms with ozone, through flights of the Purdue Airborne Laboratory for Atmospheric Research. They found the compound was most prevalent over snow-covered first-year sea ice and tundra, consistent with their snow chamber experiments. The research team included scientists from the US Army Cold Regions Research and Engineering Laboratory at Fort Wainwright, Alaska; the University of Heidelberg, Germany; the University of Alaska Fairbanks; and the Georgia Institute of Technology. A paper detailing the results of the work, which was funded by the National Science Foundation and NASA, is published online in Nature Geoscience.